A year ago I, somewhat on a whim, I signed up for Weight Watchers. I figured I'd give it a year and see what happened. 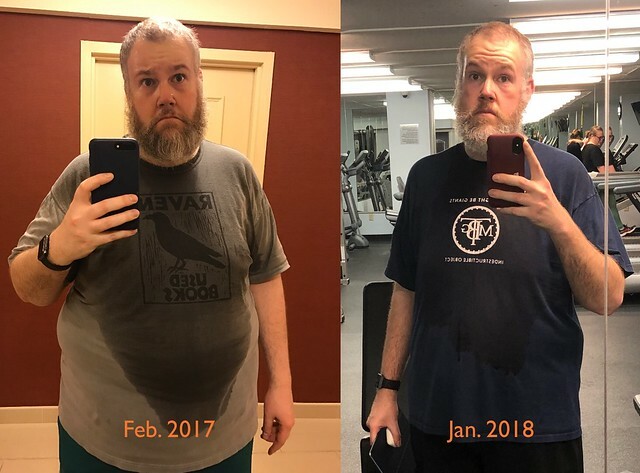 Now, I should say that I didn't think much would happen but I knew I needed to lose some weight and figured, "why not?" See, I'd lost 100 pounds and gained 80 pounds back (though I managed to keep 20 pounds off, so that should count for something). I dropped all that weight by not eating carbs and working out. That worked well, but it wasn't sustainable and so I turned to Weight Watchers. A year later and I've lost 94.5 pounds so far, and the craziest thing is that it wasn't really that hard. Sure, I can't eat whatever I want (and guess what? I generally want to eat lots of stuff I shouldn't eat in quantities that aren't advisable) and I go to the gym more often then I would like, i.e. more than 0 times a week, but overall it hasn't been that big of a change. My biggest take-way from this last year is that I have no idea how to eat like a normal person. Most people manage to make sensible food choices every day with actively following a set of rules enforced by an app. I just can't do that, however, I'm really good at sticking to clear rules about food (which was way the whole "no carbs" thing was my first choice). The fact that I can eat whatever I want, as long as I have the points to spend, makes me accountable with my eating. Intellectually, I know that having a doughnut from time to time isn't a big deal... but for me that "time to time" shifts from once a month to once a week to once a day in an astonishing short time. Weight Watchers also appeals to a strange quirk of mine: I really like to know what I'm going to eat several meals ahead of time. Now I can leverage this oddness to plan out my eating for a couple of days and know what kinds of snacks I can have. When I signed up for Weight Watchers, as I said above, I wasn't expecting much but I did secretly hope that I would lose 100 pounds by my birthday. At the moment I am far closer to this goal than I thought was possible, but I'm certain I won't hit that soft goal (I've lost about 1.9 pounds a week on average), but 100 pounds is my goal, which I'm sure I'll hit sometime by the end of February. After that... perhaps another 20 pounds? Sure, why not!